Gorgeous Timeless Antique Late Victorian European-made 18k Yellow Gold (stamped) Green Emerald and Diamond Engagement Ring. The Center Stone is EGL USA Certified 0.20ct Natural Marquise Green Emerald. Mesmerizing Transparent Green! The measurements of the center stone are 6.48x2.76x1.63mm. NO INDICATIONS of treatment are present!! It is surrounded by 2 Pear and 6 Old European side diamonds, estimated carat weight is 1.14ct in F-G color, SI2-I1 clarity overall. The side diamonds are set into Platinum. The Top outline measurements are 16.15x9.57mm – HUGE! Sits nice and low from the top of the finger: 4.54mm. The band tappers from 1.13mm to 1.64mm. Finger size 5 1/2, easy to re-size. SOLID mounting weights 2.5 grams. PERFECT look. You will have a super RARE piece that can be worn all the time. 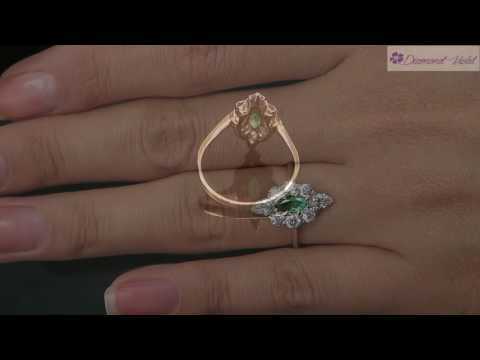 What a magnificent ring and to ask your lady that special question, or for the Lady who just loves Emeralds and Diamonds! This Jewel is perfect to cherish forever!!! Hallmarks: 18, gold, Birmingham, maker’s mark. Great Original Antique Condition, minor evidence of wear in form of tiny scratches to the metal. Money Back minus shipping, Buyer must notify us within 3 days of the receipt of the item of his/her intent to return.